Founded in 1990, Log Homes of N.E. Kansas is an Independent Representative exclusively of REAL LOG HOMES® brand log homes. Since that time, we've helped many people just like you realize their dream home. We represent REAL LOG HOMES® because unlike other log home brands, we found both the product and the service superior to others we had researched during our own home-building process. Choosing to construct our own home ourselves, we discovered first-hand how important extensive pre-cutting really is, and how the accuracy of the pre-cutting and ease of building the REAL LOG HOMES® system made for an exceptional experience. Representing REAL LOG HOMES® since 1990, we combine our years of building experience with over 50 years of manufacturing experience through REAL LOG HOMES®, to provide a home of exceptional value, and an experience that is both memorable and rewarding. We look forward to helping you as you start planning your own log home. Professionally trained in all aspects of the REAL LOG HOMES® product, we'll provide expert guidance and exceptional support in the planning stages of your log home, during construction, and after you move in. 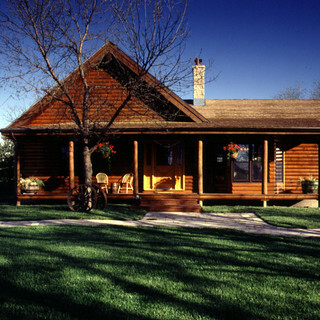 Our services include: • Guiding you through our extensive library of REAL LOG HOMES® floorplans. • Helping you customize your plans to meet your needs and budget. • Providing pricing, financing and contractor information. • On-site technical assistance at the time of delivery. As Builder/Independent Representatives specializing in log home construction, we can also help you build your home. Knowledgeable in the structural and design elements particular to REAL LOG HOMES®, we'll help you turn your ideas into a home that's just right. Most of all, we can provide you with the peace of mind that comes with knowing that your home has been built with attention to detail and time-honored craftsmanship. We're committed to making your experience of planning and building your REAL™ log home memorable and rewarding. We hope you'll spend some time browsing through our website, learning about our company and our product. When you're ready, we look forward to meeting you in person at our model home, where you can see first hand why a REAL LOG HOMES® brand log home is so nice to come home to.